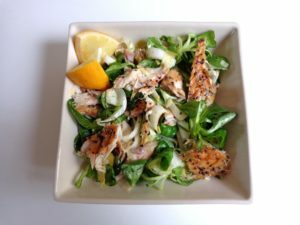 This salad is a breeze to make — it takes about five minutes — and works equally well with smoked mackerel, smoked herring, smoked trout or smoked salmon. Serve it for lunch with toast, or as the starter of a larger meal in the evening. For the greens, use a combination of tender leaves — arugula, baby spinach, baby chard, Belgian endive, curly endive, lamb’s lettuce, radicchio, or whatever you have on hand — along with some fresh herbs. As a general rule, I’d suggest using at least two types of leaves in addition to the fresh herbs. 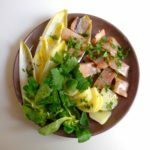 You can either make this as a mixed salad, as pictured above with smoked mackerel, or as a salad plate, perhaps with a boiled potato on the side, as shown here with smoked herring. With the herring, instead of making a mustard sauce, I simply drizzled a little lemon juice and olive oil over the plate, and sprinkled the veggies with salt and pepper. If you like Scandinavian mustard and dill sauce — which, unlike French mustard, is sweet — you can add a dollop on the side. Remove the skin from the fish fillets as necessary. Cut the fillets in half lengthwise, and cut or tear into bite-sized pieces. If using Belgian endive, rinse and slice crosswise into fine rounds. Rinse the tender leaves and spin dry. Finely mince the the scallion or shallot. In the bottom of a large salad bowl, mix together the mustard and lemon juice. Add the oil one teaspoon at a time, stirring vigorously to create an unctuous sauce. Season with salt to taste and grind in some black pepper. Add the minced onion and stir in. Add the greens to the bowl and mix. Add the fish and mix again. Chop the herbs roughly, add them to the bowl and mix once more. Serve the salad on individual plates, garnished with small lemon wedges. Serves 1 as a main dish, 2 as a starter.